This cozy loveseat combines smoothly flowing flared, rolled arms, curved sculptured feet, and a soft, textured fabric upholstery. Imagine sinking down into this exquisite living room piece and relaxing. With its traditional, stylish shaping and two accent pillows with fringe, this loveseat will embrace a classic yet comfortable style in your living room. The Lanett Loveseat with Faux Wood Accents by Signature Design by Ashley at Walker's Furniture in the Spokane, Kennewick, Tri-Cities, Wenatchee, Coeur D’Alene, Yakima, Walla Walla, Umatilla, Moses Lake area. Product availability may vary. Contact us for the most current availability on this product. Pillow 2 Square Accent Pillows with Fringe. Print Pattern on One Side. 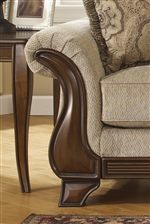 The Lanett collection is a great option if you are looking for Transitional furniture in the Spokane, Kennewick, Tri-Cities, Wenatchee, Coeur D’Alene, Yakima, Walla Walla, Umatilla, Moses Lake area. Browse other items in the Lanett collection from Walker's Furniture in the Spokane, Kennewick, Tri-Cities, Wenatchee, Coeur D’Alene, Yakima, Walla Walla, Umatilla, Moses Lake area.